Our union contractors and Local 825 Operating Engineers are proud of a record of quality and safety that has come to define their work. This reputation comes in part from our years of training and experience and also from legislation that requires all contractors to meet the same standards and preventing any from undermining those standards by cutting corners. It is well known that low-bids don’t always result in the lowest cost. Sometimes a low bid is the result of inferior work, incorrect bidding procedures and use of less-skilled workers. To protect public and worker safety, and to level the playing field with all bidders on a project, the government requires checks to ensure a standard of quality workmanship. These requirements come in the form of prevailing wage laws, project labor agreements and proposed expansion of contractor registration requirements for public utility projects in New Jersey. A prevailing wage levels the playing field. It prevents less scrupulous contractors from unrealistic low bidding by paying workers substandard wages and benefits. Prevailing wage requirements require that labor costs be the same, whether union-trained, union-backed workers are employed or a company uses workers with less training and less experience. This would incorporate a set of qualifications in construction bid specifications to ensure the selection of qualified construction professionals. Such language puts bidders on notice that – in addition to the lowest price – quality criteria will be considered when awarding contracts for work on public buildings and other construction projects. 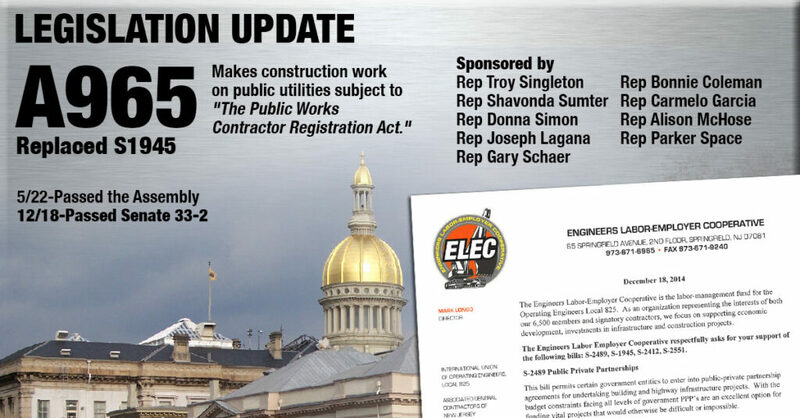 Senate bill 1945 would have required contractors working on public utility projects to obtain a New Jersey contractor registration to ensure that public utility work is performed at the highest level of quality, skill and responsibility. Although vetoed by former Gov. Chris Christie, contractor registration remains an important issue that ELEC825 will continue to pursue in the new administration. Using project labor agreements, developers generally secure better workforce conditions, obtain higher productivity in uninterrupted labor hours, stipulate dispute-resolution procedures in advance and monitor safety conditions. Federally funded projects require PLAs, as mandated by the federal government. PLAs ensure that projects are completed on time and on budget and requiring a level of employee training. 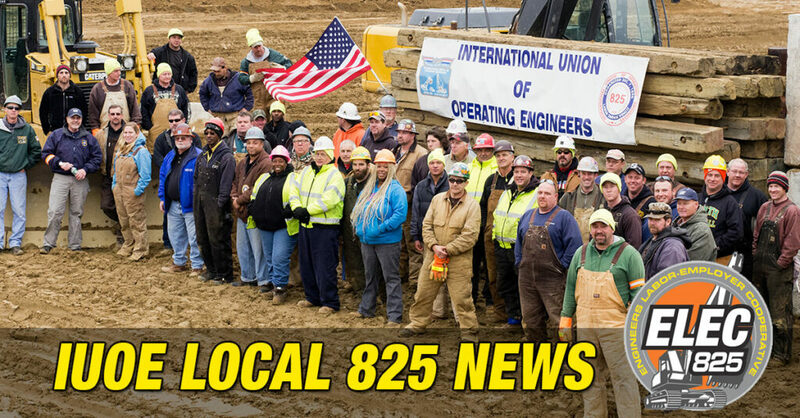 Our union contractors and Local 825 Operating Engineers enjoy the highest record of quality and ELEC825 is fighting to maintain that standard.